The sooner the better. Early planning ensures product availability. A reservation will confirm the items you need will be available on the day you requested. 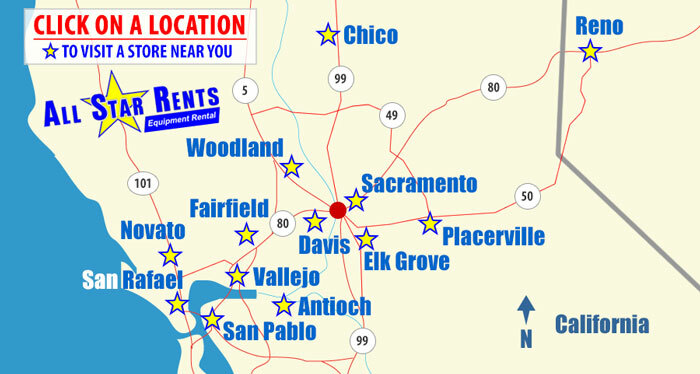 Yes, our rental professionals are always available to help you evaluate your needs. We can suggest items to you to help your project go smooth and safe. Additions to your order are always welcome subject to availability. Please remember we always do our best to accommodate your needs. All equipment has minimum charges for periods ranging from 4 hours to one day. The daily rate is good for 24 hours (party and event items�72 hours!) We do charge for all time out, whether the equipment is used or not. Items with hour meters are limited to 8 hours use per day; 40 hours per week and 160 hours per month. Overtime rates do apply for multi-shift use. The fee is based on the size of the order, the distance we travel and any out of the ordinary requests. Call for a specific quote. Our goal is to deliver you items when you want them. We may ask for a window of time if you can accommodate it. We can also deliver the previous evening and start your time the next morning if you need to get started before we could get it to you. Full payment is due before items are released to the customer. A payment in advance on the reservation ensures that those items will be held just for you for a specific date. Credit or debit cards are required to rent items. Other payments can be accepted upon return. We accept American Express, Discover, MasterCard and Visa. All items should be returned as you received them. Please knock off loose and excess dirt or mud. A cleaning charge may apply. Fill the fuel tank to avoid fuel charges. Keep items in a secure location until we can pick up delivered items. We do charge for all missing, broken, and damaged items at full replacement cost. Be sure equipment is secured when not in use and protected from the weather. To relieve the renter of accidental damage to rented items we do offer an optional equipment protection plan. The fee is 14% of the rental. All items damaged or broken must be returned to the rental center to be covered under this plan. Missing items will not be covered. This optional plan is decided in advanced and is non-refundable. Services are available for an additional fee but these arrangements must be made in advance. When tents are ordered our staff will set them up and take them down for you. We do not supply operators but may be able to recommend a local contractor. You are also welcome to come to the store in advance of your rental and we can review operations with you. 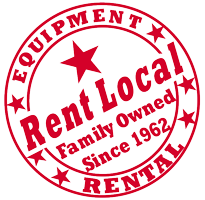 We are a dedicated rental company who have been in business over 50 years. We take pride in our equipment and will have them ready for your immediate use. We have a professional caring staff who will help you make your event a success. Please use our online questions / feedback form or contact your local store.